The average spot goes for between two to four million big ones, so the stakes are already fairly high when it comes to producing a spot for the Super Bowl. They’re supposed to make you laugh, some of them aim to make you cry, while others just want you to remember them in a sea of the crème de la crème of American advertising. Most of this years’s ads were highly entertaining, but as always there were some high achievers, and inevitably some losers when it came to creating great TV spots during advertising’s biggest night of the year. Clever, heart warming and fun to look at, Volkswagen hit the nail on the head with this clever spot. 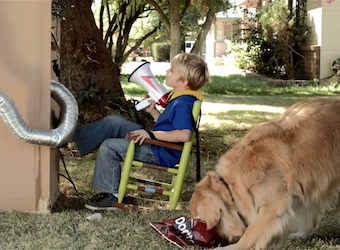 The next ad was hands down the favourite spot around our office – what’s not to love about a grown man being outsmarted by a school kid with a nothing but a cardboard box and a packet of Doritos – it could happen to the best of us. T-Mobile ‘What can Tim Tebow do with #nocontract? The spot takes American footballer and ‘free agent’ Tim Tebow and shows us exactly what the guy is capable of without a contract. Let’s just say the guy makes delivering a baby and tackling Big Foot look pretty easy. The fact that the Scarlett Johansson quit as the ambassador of Oxfam due to the charity’s criticism of one of SodaStream’s production factories makes this ad a little sour to begin with. It was also extremely predictable, using a premise that has been done a thousand times before. This spot has had mixed reviews, it certainly had elements of humour to it, but was probably not on the same level as some of the other spots aired during one of the most globally watched television events of the year. We get the point of the getting the loveable Full House crew back together, but the execution of this spot was just a bit too cringe-worthy for our liking.